Wayde van Neikerk’s, 400m Gold medal performance, gave the 55,500 plus spectators in the London Stadium something special to roar about on Tuesday night at the IAAF World Championships. The World record holder who was second out of the blocks after American Fred Kerley, led out of the bend into the home straight where his advantage was extended. 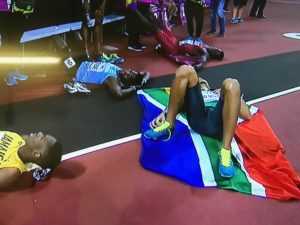 Wayde van Neikerk — (F)Lying the Flag! 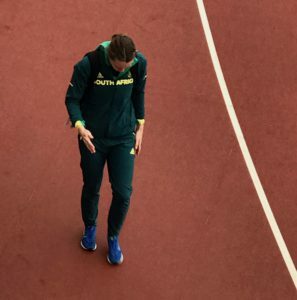 The ease with which van Neikerk broke the 44 seconds had the crowd gasping and suggesting the world record would have gone had the Bloemfontein Bomber not slowed over the final 10 metres. As with the Rio Olympic performance the telling factor lay in his efficiency and ability to hold better pace over the final 100m, when other are slowing gave the impression that he pulled away. The event was marred by the controversial withdrawal by the IAAF of Isaac Makwala, who were concerned that the Botswana speedster may have had norovirus, as diagnosed by their own medical team. If that were the case then in addition to the risk to the athletes own health the risk of infecting other athletes had to be considered as this has previously been seen to be an extremely contagious virus. Over 30 athletes and support team had been diagnosed with the virus by Tuesday. Makwala was adamant that his vomiting in the warm up track on Monday was a result of physical effort, not the virus. The man from Botswana, who also wanted to compete in the 200 / 400m double, presented himself at the track, under the eye of the TV camera, and was turned away, then escorted from the stadium under instruction of the IAAF. On his form this season this would have been a stiff challenge to van Neikerk who was genuinely disappointed that Makwala was not in the field, but no athlete has control over who his opposition is in a race. Having given his previous World, and Olympic, medal to his mother, who was adamant that any medals that were achieved while he lived in the family home, remained in the home, this London medal would be the first that he could keep in his house. When asked all three athletes were particularly pleased that this time round the coaches of the medal winners, also received medals. This innovation falls in line also with Lord Sebastian Coe, the IAAF President’s comments earlier in the week, that coaches are the mainstay of the athletic support, and the key to the future of the sport. Earlier in the evening, Justine Palframan qualified for the 200m semi final as the second of three fastest losers from seven heats. Justine Palframan qualified for the 200m semi final as the second of three fastest losers from seven heats. Justine Palframan in thought leaving the warm up for her 200m heat on Tuesday night. The ex KZN, now Boland athlete was second from the blocks and looked to have a solid run, but by her own admission knows the focus was not in the correct place throughout the race. “I was sleeping at times, there are things to work on, but I wanted to be able to put a smile on my face, and I have that smile,” said the 23-year-old from Stellenbosch. 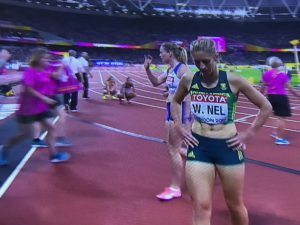 Wendy Nel was not as fortunate in her 400m hurdles, failing to progress from the first of three 400m hurdle semi finals. In chilly and windy weather, the 29 year old ran strongly from the gun but clipped the final hurdle losing momentum to finish third behind Czech Zuzana Hejnova (54.59). 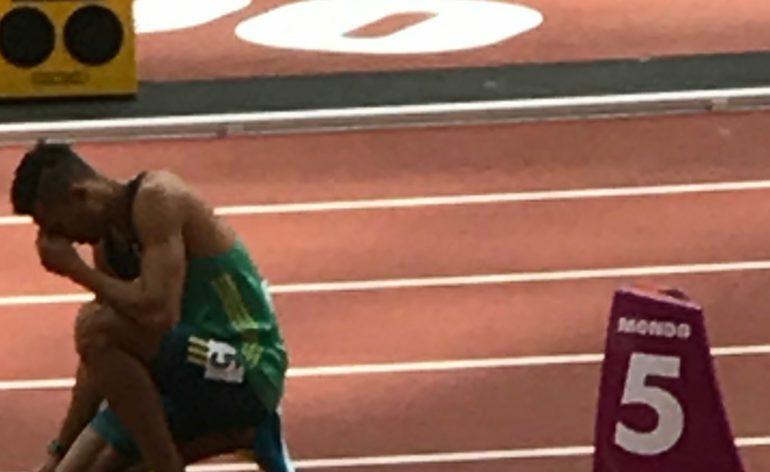 With the top two automatically qualifying, and only the two fastest losers making up the final, Nel was already eliminated by the second semi where both third and fourth places had improved on Nel’s 55.70. The focus will now changed to the final few Diamond leagues and then the planning and build towards Gold Coast Commonwealth Games in April.